The Tax Policy Center has now done a more detailed analysis of Rick Perry’s flat-tax proposal, and guess what? It’s really great for rich people! Since Perry’s gimmick is that everyone can choose to stick with the current tax system if they want, nobody would end up paying higher federal tax rates under his proposal. So the only question is how much everyone’s rates go down, and the chart below tells the tale. If you’re smack in the middle of the middle class, your rate goes down about 2 percentage points. If you’re a millionaire, your tax rate goes down 20 percentage points.1 Ka-ching! On a side note, this is how you one-up Herman Cain. 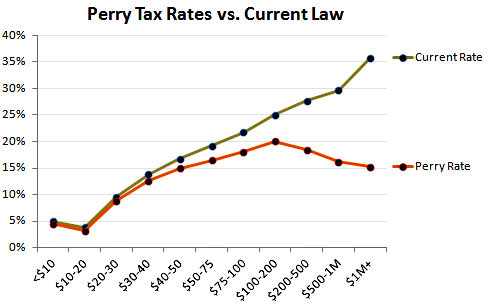 Perry’s plan offers lower rates than Cain’s 9-9-9 plan to every single income class. The poor pay less, the middle class pays less, and the rich pay less. Of course, this also means that Perry’s plan produces way less revenue than Cain’s plan: TPC estimates that it would produce $1 trillion less than current law in 2015. But TPC is using fusty, old-fashioned static analysis, while all the cool wingers use dynamic scoring, which assumes that Perry’s tax plan supercharges the economy and therefore pays for itself. Just like Reagan’s tax cuts and Bush’s tax cuts. Caveat emptor. 1All of this is based on the assumption that the Bush tax cuts expire as scheduled. The “current rate” numbers are a little different if you assume that the Bush cuts are extended. But why would anyone bother to extend them if they’re going to pass Perry’s shiny new plan that just replaces the current code anyway?